Well not sure about yourselves but I am just a bit p....d off writing about things medical. Yes we will keep you informed of how things go but as I am feeling good at present I would like to continue the journey we were making to Chester to meet two of our U.S. friends after they had been on their UK and part of main land Europe cruise. Sorry Cheri and Jerry we just couldn`t make it. View of the right hand side of the top picture is of interest. Just to the right of those three steps was the entrance to the basin. 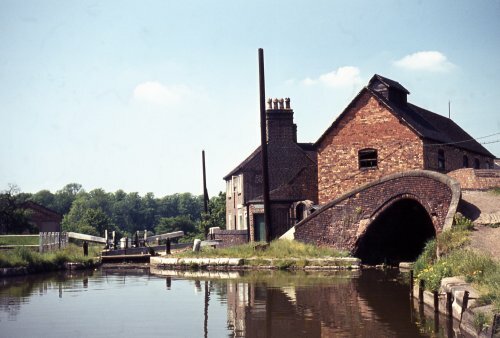 This was the entrance to Minions Wharf that was in 1769 the end of the Coventry canal that had been granted and act of parliament to build through to Fradley on the Trent and Mersey. Lack of cash caused the building to cease at Atherstone. Some would reason the Coventry company were in no hurry to re-commence building as this would open the way for cheap coal to come from the north spoiling the business being done with the coal fields in Bedworth, Nuneaton and Hawkesbury to name just a few and I tend to agree. Intervention by the Trent and Mersey and Birmingham and Fazely companies saw the canal reach Fradley untill 1789. So as you look at the top picture you can see why there`s a winding hole in what appears to be an awkward place, the width was needed to enter/exit the wharf basin. A is the winding hole, top lock and Minions wharf entrance. B is 68 Coleshill road. C is the Wilson and Stafford hat factory. D is the Minions Wharf basin. This is the area of the Minion basin using a late 1890`s map over a modern day map. Try this link the image can be changed by using the transparency overlay slider bottom left. The only buiding left from the Days of Minions wharf. Probably built as the wharfingers house back in very late 1790`s it`s now listed as a private residence, somehow doesn`t look very lived in does it. Hat making in Atherstone began in the 17C. and this building is the last of seven hat makers in the town. It was owned by Wilson and Stafford and closed in 1999 and was due to be demolished to build flats in 2008. It had connections to the slave trade link here. In 1828 Gilbert Minion, who gave his name to the wharf, was listed in a trade directory and later in 1850 other family members were listed. Warehouses and other buildings were still on the site in 1970 when the site was cleared with the exception of 68 Coleshill road and the basin was filled in to build houses. Follow the link HERE and scroll down to case no. 24 to read an 1847 interesting court report about a break in at Minion Wharf. In fact the whole link mentions many boating incidents. Seven years transportation was the sentence and in those days you found your own way home so many chose to stay in places such as Australia that their crimes had made their homes. Well I enjoyed that. Being able to sit and type research and delve back into blogging was fantastic. The quote above comes to us thanks to Ken on NB Dogma. It is perfect and he offered it up to us at just the right moment. This is just a quick overview before I get started on my day. Two consultants showed up at Les' bedside hemming and hawing about “possible bone thinning cause by the first five days of radiotherapy Les underwent back in 2013." “Nope,” both consultants shook their heads, sad faces moving in unison. “Oh no, no, no. no, this couldn’t possibly be caused by his treatment.” And then they left. I knew there was something we weren't being told! I could not figure out why we had been given the same vague statement repeatedly for over a month and a half now. At some point the Oncology team at the RFH knew what they were seeing was in all probability a second line cancer and they were stonewalling us until they had a more exact answer. This is the problem for patients you see. If you don't know which questions to ask, then you will never get a direct answer. It was my probing question about the MRI’s showing no differences and my pinning them down with their own answer: nope. No change; well then doesn't that mean we have a definitive diagnosis of bone mets? which backed them into a corner and made them come clean with their exact concerns. The trouble is patients don't know what to ask, so they seldom get the answers they need until the last moment when the Oncology team is assembled and ready to rush the shocked and dazed patient into the treatment modality. "We've reviewed all the scans, and we've called in an orthopedic specialist from Stanmore hospital to review them. We are still waiting for the information from Mt. Vernon but the folks from Stanmore are on the case now as well so we should have it soon. We suspect what we are seeing is a second line sarcoma and we need to be sure." That last statement was slipped smoothly in on the end. 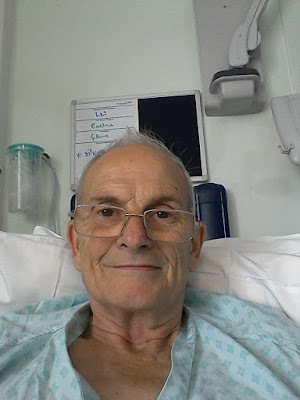 Les:" A biopsy to my spine has been mentioned. What good will that do me? If it is bone mets or sarcoma what difference does will a biopsy make?" Todd: "Well it will make a difference in how we treat it, and in what medicines you are given." Les: "What do you mean by medicine? Do you mean chemo? Because I won't have chemotherapy." Todd--taken aback by Les' statement--as if he had offered Les a lifeline and Les was choosing to throw himself off a cliff instead: “Well, it is too early to make any choices about treatment yet when we don't know exactly what we are looking at. So let's leave this conversation for another time. We are going to discharge you tomorrow. Once we have a definitive answer from Stanmore we will be in touch and you can come down for a meeting with us so we can get treatment underway." I washed all the curtains Monday and hung them back up to dry while I was gone to London. Tomorrow I will wash all the throw blankets and yesterday I washed all the windows, the boat roof, stern area and well deck in the front. Les may return and find NB Val unrecognizable! It has been months since we’ve had the time or the energy to do anything other than the most basic daily chores. I must go now and get myself sorted before heading out on today’s journey down to the Big Smoke. My baby is coming home today! We will sit on the bow in the sunshine and sip our iced coffees. I will fix steak fajitas for dinner tonight. Tomorrow Mike W. is taking me to Tesco’s and we will have roast chicken dinner and fresh apple pie and watch movies on Netflix, while we come to terms with this current scenario. If the weather holds we will cruise off somewhere quiet for a couple of days and begin going through the boat from stem to stern, while I make notes of every system on board, how it works, what parts are involved with part numbers, and sources, and what things to keep an eye on; any maintenance invovled and how to go about doing it. In the meantime I offer my deepest gratitude and thanks to everyone who has commented on Les' post with such great love and friendship. Deep thanks as well to the boating community--both locally and spread out across the cut, for letting me know in an unobtrusive but loving manner that we are cared for and watched over; that someone is available if and when we should have a need. What you offer us is priceless. It is the true face of loving kindness: humble words and deeds in time of greatest need. Much love to our family on both sides of the world, for staying strong with us on this toughest of journies. Thank you all so much for your comments they really do give Jaq and I a very warm loved feeling. The boating community is I think quite special be they leisure or liveaboards and not forgetting those never having stepped on a boat but who just enjoy following others adventures and walking the canals and rivers. Help has come from all sections not forgetting Jane a volunteer locked who helped us down the Stoke Breurne locks. Thanks everyone. Well still awaiting decisions on what will be palliative treatment as talks are now going on with Stanmore Orthopaedic hospital and another bone specialist unit. When we get news and family have been informed we will pass news on to you our second family. After leaving hospital I intend to get some blogging done but my pictures are on the laptop and big fingers on phone is not easy. If you want to learn anything from my experiences can I offer the following. Don't put off getting help from nurses be they attached to your GP area or hospice, they can open up quickly other avenues of help. Also even if you feel healthy but have been toying with an idea of a change in life style or special trip please don't put it off, life can be so short. There are two special people who I keep nagging to make a trip down that west coast, you know who you are please do it. As I look back to when I decided to retire after Valerie passing I just give thanks I decided to change things then and not wait till day 65. At 68 I haVe so far, still counting, had 11 years on the boat and a special 5 years with Jaq. Hello everyone. After nearly three years of fighting Mr. C. I have to admit he's getting the upper hand but with the castards worldwide record of causing pain and misery that's not surprising is it.Jaq and I have spent just a little short of three years chasing our Mr. C. Around my body and I think we were successful because the coward has now gone deep into cover by seeking refuge in my Pelvic area and pressuring the nerves to my back and legs. So now I face as of a month back an estimate of 6-12 months to live.Yes I'm dying, no other way to say it and please don't be frightened to say anything that you think might upset me. I've told many who have visited no words or phrases are banned in my presence. Take a look at the picture taken Sunday 14th August as I type this. Do I look to be just about ready to check out of this world, no not just yet. My last post was to the effect of being unable to blog because of back pain and this is still the case only now we know the cause. As you can see I am sitting up in hospital typing this but have Morphine via a slow release tablets and by mouth on demand. I came in here a couple of days ago so I could have another MRI scan to see what my best options are for palliative one off, for now, radio therapy for pain relief and of course to get the exact dosage of slow release Morphine tablets decided. Hoping the therapy will be decided Mon\Tues and I can get home. blanket that seems to be filled with Velcro blocks that are pushed close to you whole body sticking together to form a mould around your whole body. It is strapped closed and you can be tilted in any direction without your body flexing. Imagine a normal board where you lay flat this thing enables them to tip me head or toes down or on my side and I never moved at all, like you had been soaked in plaster of Paris. It was developed to carry patients up twisting stairwells in ships engine rooms or stairs similar to those say in a lighthouse. Not having the pain under control lead to an ambulance being called that resulted in a car and paramedic who was concerned of pressure on my spine so called for the ambulance to collect extra staff because of the tight area in the rear boat bedroom. It was decided to send for a car to collect the blanket device. On my side through the narrow corridor laid across the cooker and the back of the dinette sideways through the front doors and straight onto the stretcher and I felt no body movement at all. So an MRI scan led to Stoke Mandeville hospital entering into discussion and sending images back and forth with my pain relief increased I returned home late evening. The following lunchtime the Royal Free in London who have been looking after me for sometime phoned wanting to admit me for tests and monitoring plus another scan. At least I can with just some discomfort sit still long enough to read and type this. We had cruised as far as Gailey on the Staffs and Words canal before I kept getting strong urge to turn back south. This was before on the advice of the osteopath I contacted the Royal Free who arranged another scan. 48 hours after which they phoned with the news and an appointment for Oncology. So a lot of travelling but a lot of help from the boating community was most welcome with just Jaq able to do locks while I steered it was OK on long pounds but my pain increased and Jaq put out a call for help while I was laid out on the folded down dinette. We had Arthur doing a very long stint of two flights helped by his daughter, Ken and Sue, Jennie and Chris then Adam, all boaters. Jaq still has to have her other knee replaced as it's getting worse with all the extra work looking after me, again friends have come up with suggestions to make this happen as it will not be near where we are now. At the moment we are on the southern Grand. Union and have a mooring arranged by friends while the boater is cruising at least till end of August perhaps longer. We are connected with the GP who I've had since the bowel surgery plus the nurses and also the visiting Ian Rennie cancer hospice nurses. Some might think it's a bit early to be thinking of hospice services but you are very wrong. These two sets of nurses work together and can arrange changes of medication without my having to step into the surgery and within a few minutes they can get through to your GP. and get new prescriptions without you having to make a GP appointment. They also arranged for people to come and see what they can do to make movement around and in and out of the boat or perhaps your house. Hoping to get a stool or seat to fit in shower in case the legs weaken as they have once or twice, not a lot of space to fall and avoid something to hit if you fall in a boat bathroom. So I do encourage anyone in a similar position to get known via your GP to theses angels. Sorry to have gone on a bit and perhaps in the near future I can do some more boating blog posts. Not sure if I missed anything but ask what you will openly or if wanting anonymity use e mail. The view from the 11th floor here is to the east and takes in the Shard, St. Paul's Cathedral and Canary Wharf plus a few city sky scrapers. 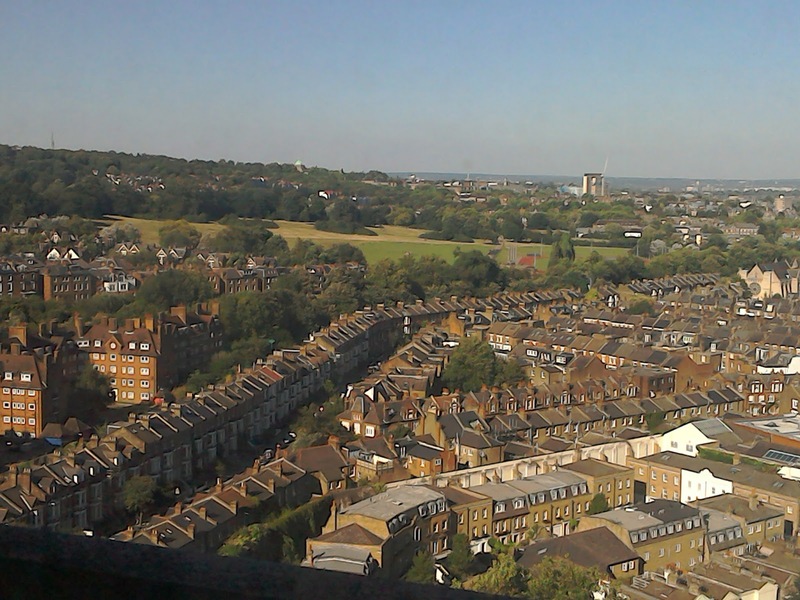 North East is Parliament hill and the edge of Hampstead Heath. 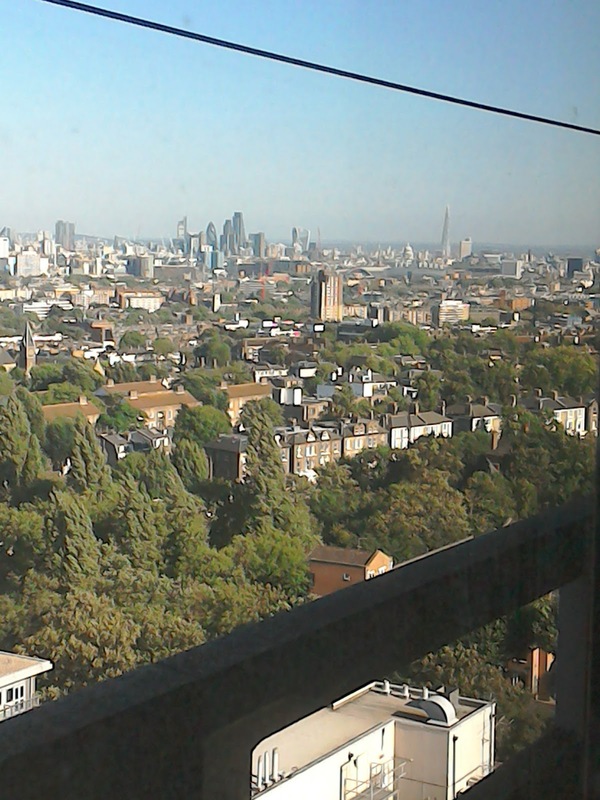 I can also see the Olympic stadium. A bit woozy with all the meds so hope it all makes some sense.